Our usual stops were The Suburban House, Attman's, Miller’s Deli, Joan and Gary’s (now Goldberg's) bagels, the Knish Shop and every now and again, DiPasquale's. We feasted on corn beef and coleslaw sandwiches at Miller’s, six inches high. Snappy pickles and Dr. Brown’s soda. Just out-of-the-oven meat knishes at the Knish Shop that warmed our hands on cold winter days. Thick cut lox piled on top of tomatoes, onions and cream cheese on a pumpernickel bagel from Goldberg's. My favorite, the hot pastrami sandwich at Suburban House. Served in a room of mirrors with a side of kugel. Our every now and again trip to the Italian market was always made special by the different smells, the completely different culture. 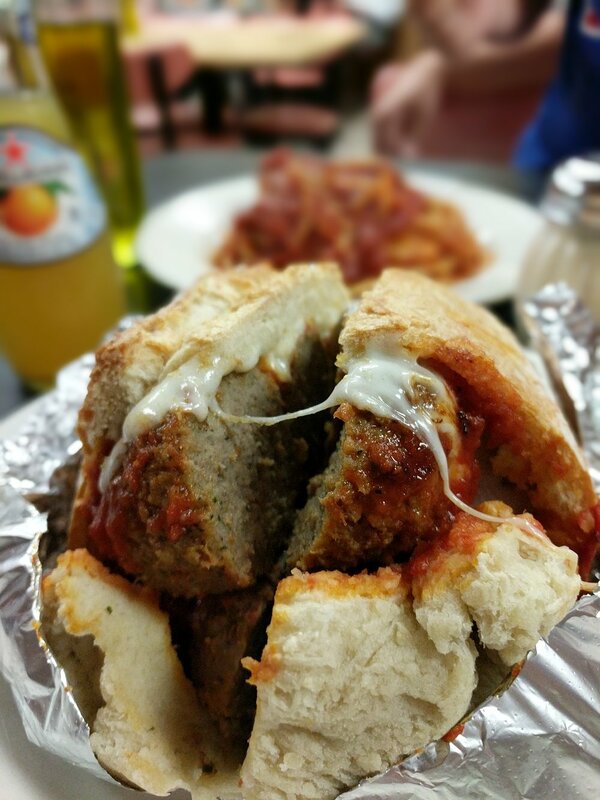 The emphasis on cheese and for us, the perfect meatball sub. Perfect isn’t a word I use lightly; these subs were special- occasion worthy. A few years back I chased my wanderlust all the way across the country and settled into a city where there are no Deli’s. There are no Italian markets. There is no corned beef at the deli counter at the grocery stores, no rare roast beef either. There’s a Jewish neighborhood where I drive 30 minutes to for food for the high holidays. Otherwise, now I am succumb to eat the modest fare of my surroundings. I rarely have bread as finding wheat around here is a huge undertaking. I have to get my pizza through a series of underground tunnels. I am resigned to the unexciting food samplings as there is a trade off in my mind for the opportunities I have here professionally and personally. It didn’t hit me until I was pregnant and was told I was not allowed to have cold cuts. No deli meat. I cried reminiscing of dark rye with horseradish and thin cut, steamy-hot pastrami. I could feel the soft bread sticking to the roof of my mouth while the horseradish stung my nose. Immediately after giving birth I ordered two sandwiches from the hospital kitchen and I’ll never forget the sensation of eating a sandwich after going without for almost a year. I had a son and a sandwich and life had never been so sweet. Recently I went back home to Baltimore for my little brother’s wedding. I took a non-stop flight on an economy airline that offered us passengers a little bag of pretzels to satiate for the six hour duration of the trip. That awesome feeling when my blood sugar gets so low that I'm sweating and breathing shallow and trying to see through the spots in my blurred vision. When I landed and finally made my way to the curbside pick up my Dad drove up, rolled the window down and asked, “Are you hungry?” “Yeah,” I replied, “I could do a sandwich."